On Target Throwing Axe With Sheath - One-Piece Stainless Steel Construction, Blade Edge And Spike - Length 9 1/4” | BUDK.com - Knives & Swords At The Lowest Prices! 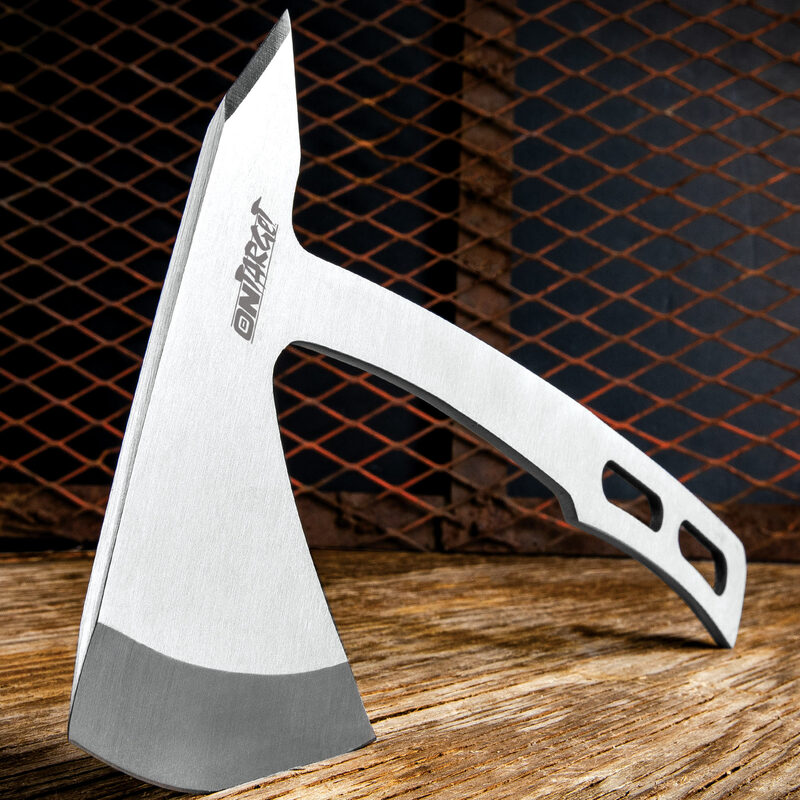 Perfect the art of axe-throwing with the lightweight and perfectly balanced On Target Throwing Axe. Its aerodynamic design is almost guaranteed to improve your skills. 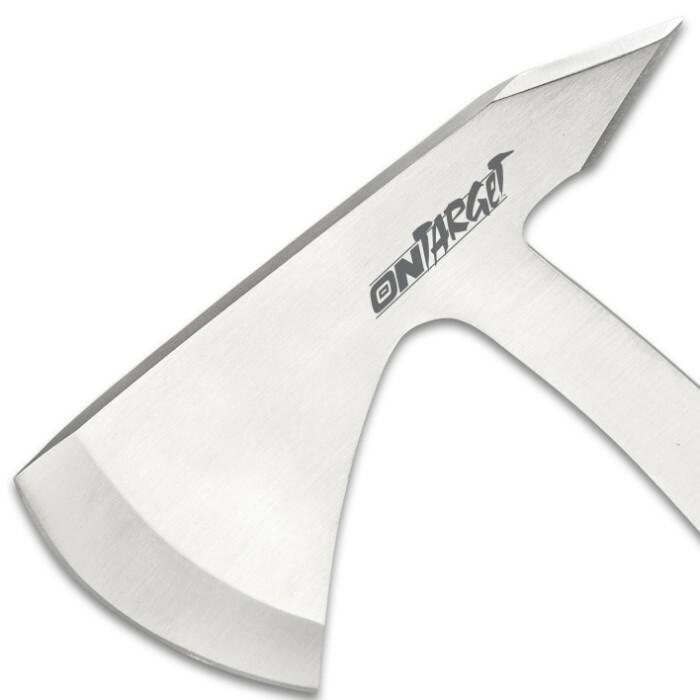 The throwing axe has a one-piece, solid stainless steel construction with a slotted handle and a slightly curved design. The 5 1/4” head has a razor-sharp 2 3/4” blade on one side and a penetrating, double-edged spike on the other side. 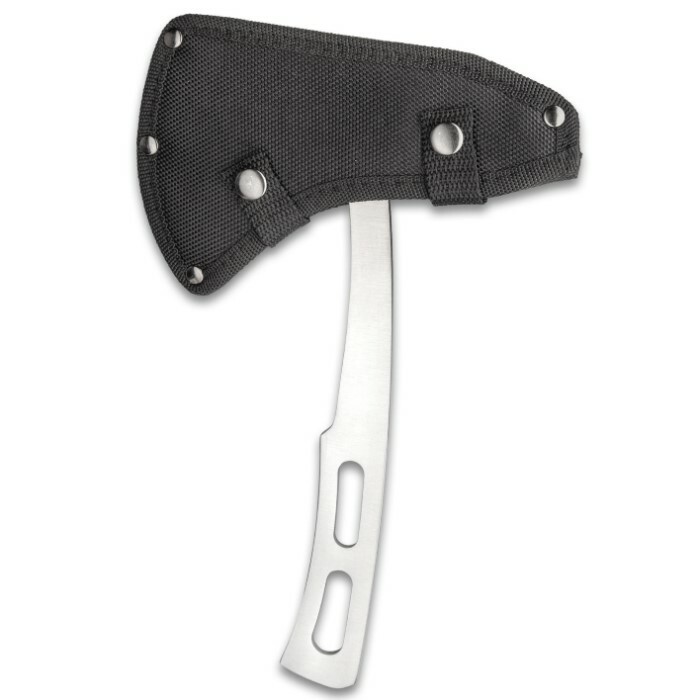 The throwing axe comes with a sturdy nylon blade cover with secure snap closures and a belt loop for ease of carry. 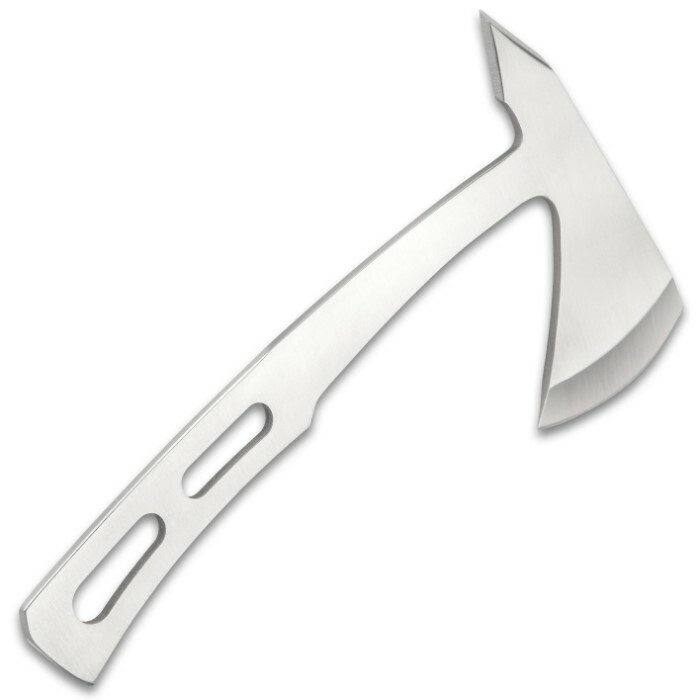 I’ve ordered a few different items from BudK, some were good some were bad, I’m happy to say that this throwing axe is one of the amazing ones. I put this axe threw hell: throwing it against oak targets (one of the tougher woods), taking it in my hand and hacking away at my targets as hard as I could just pulverizing them. This axe is extremely durable and doubles as a great hatchet breaking small limbs in just one swing and some of the bigger limbs in as little as two or three swings and keep in mind I’m only about 160lbs so I don’t have too much power behind my hits but never the less it still performed marviously. The only “problem” I had with this purchase is the sheath, unlike a regular hand axe sheath where you would be able to slide the handle through the top of the sheath into a slot that lets the handle through but catches the blade then has a strap going over the top of the sheath to hold the axe in place while this one goes from the bottom but that dosent bother me anymore. In conclusion a must buy, will definitely be getting more in the future for my bug out bag and camping bag.